Update - create even more with Calafant kits! Update – create even more with Calafant kits! Be it school holidays, long weekends or rainy days, when there are long days ahead the kids look to you for entertainment and they expect you to deliver. Once you’ve exhausted all the usual children’s activities around town, it’s time to get creative in your own home. Fortunately Calafant is here to help in all their creative cardboard glory! 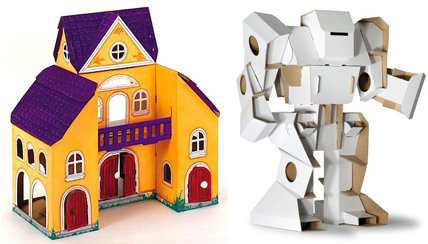 We’ve mentioned the fantastic and ever so clever Calafant before and are excited to let readers know they’ve added to their awesome cardboard kit collection. We love the Doll House with all its opening doors and paned windows. The Three Little Pigs kit is great for beginners and comes complete with textas. For the older kids the Robot stands at a mammoth fifty-two centimetres tall and perfect for hours of imaginary play. The Calafant cardboard kits don’t require any glue or scissors for assembly which I think is terrific (it saves me the hassle of having to find both!). Remember these kits are white so they can be decorated any way your child likes – their imagination is the limit! The Three Little Pigs kit is priced at $19.95 and available from State Of Green, with delivery available Australia wide.